Snow returns to our forecast with Winter Weather Advisories issued for Friday. Here we go again another round of wintry weather for Central Maryland. Winter Weather Advisories have been issued for Harford, Howard, Anne Arundel, Carroll, Baltimore, Frederick, Washington, Allegany, and Garrett counties from Friday 6am-3pm. A quick moving clipper system will give us a brief brush of light snow and with frozen ground below we have the concern for dangerous travel. Snow amounts will not be all that much but still enough to cause problems. Wintry weather starts to move into the Baltimore metro and surrounding suburbs between 6-9am Friday. Most locations will start cloudy and cold with temperatures hanging in the lower teens before the snow spreads in. As it stands now the morning rush should be okay with snow coming in on the tail end back along the I-70 WB corridor. Snow picks up in intensity between 8am-12pm before the system quickly departs by mid to late afternoon. This will be a HIGH impact event for travel since temperatures don't look to climb above freezing and the ground is frozen solid below. Even out along the Eastern Shore from US-50 to US-301 slippery travel conditions are likely as the system clips on by. Snow totals with this storm are more of an annoyance if anything but still enough for problems. . Areas such as Carroll and Frederick counties will see the heaviest amounts of snow with localized spots of 2". Further south in Baltimore and along I-95 a quick coating to 1" of snow is likely before the clipper departs. Tricky travel will be widespread even on treated surfaces since salt effectiveness goes down by 5 times its usage with temperatures in the teens and 20s. Plan accordingly for slick travel concerns as anything that is snow/liquid will freeze immediately especially on those elevated surfaces. Road conditions won't improve much until we get to Saturday afternoon with temperatures climbing back above 32 degrees. Snow moves by 6-8am Friday. Road conditions are likely to be impacted fairly quickly as temperatures hover around 12-18 degrees during the onset of the event. Areas around South Mountain and along US-15 toward the Catochtins could see snow amounts around 2". US-340 toward Boonsboro/Brunswick and I-70 West Hancock/Sideling Hill likely to see 1-2" amounts as well due to extra lift from the mountains. Prepare for dangerous travel. 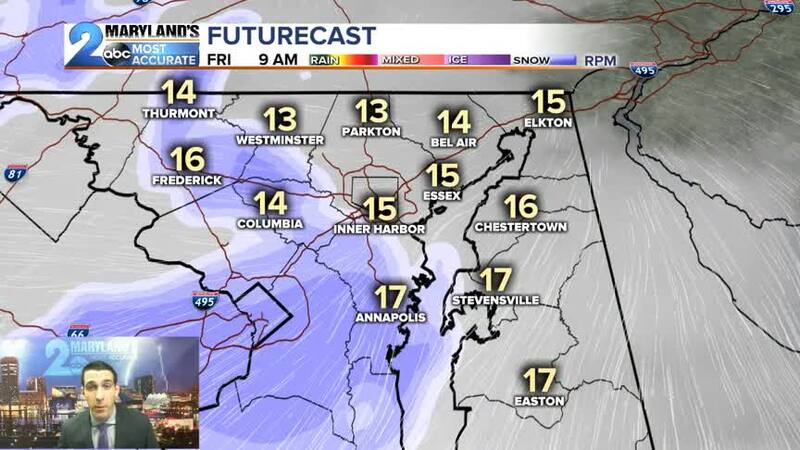 Snow moves in by 7-9am Friday morning. Slippery roads are likely especially on elevated surfaces such as I-83 from the City north to Parkton. Problems are also likely to occur north of MD 136, MD 152, and the PA/MD line even with amounts there around 1-2". Most areas like Towson, Eldersburg. Taneytown, Monkton, Cockeysville, White Marsh, & Middle River are looking at Dusting-1" of snow. Precipitation will start with a few flurries before changing to light snow after 7am. Light snow will last through lunchtime before the storm departs. A dusting-1" of accumulation is likely in these areas causing slick travel concerns. Upslope snow combined with the clipper system look to give us 3-5" of snow in these location. Those areas above 2,500 ft such as Keysers Ridge, Big Savage Mountain and Oakland could see the amounts closer to 5". Snow covered roads and dangerous travel concerns as temperatures hang out in the low teens. Snow arrives between 4-6am.